Comes full up with heavy-handed signifiers, from Ben's choice of reading (Hemingway...) to a hammered motif of lapsed Christianity (the climax takes place in a rotting church) that underlines the theme of living with the sins of the past. 91 min. Milennium Entertainment. Director: Mark Steven Johnson. Cast: Robert De Niro, John Travolta, Milo Ventimiglia. Those of us who grew up on Robert De Niro and John Travolta movies will find Killing Season especially difficult to take. Once stars begin to fade, the "B+"-movie market begins pairing them up in the hopes of drawing hopeful suckers to weak offerings. After the "A+" Heat, De Niro and Al Pacino teamed up on the weak-sauce Righteous Kill. Now we get a similar cash-grab pairing De Niro and Travolta under director Mark Steven Johnson (Ghost Rider), in a project once intended for Nicolas Cage and Travolta to reteam under currently imprisoned director John McTiernan. 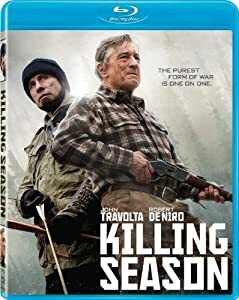 Designed as a two-hander, Killing Season casts De Niro as Benjamin Ford, a former U.S. soldier whose war trauma—and perhaps one particular sin—have led him to hide from the world in a remote Tennessee cabin. Needlessly tipping the film's hand (presumably with the intention of creating tension that never surfaces), the film introduces us right away to angry Serbian Emil Kovac (Travolta), who narrowly survived being shot point-blank in the back (gee—I wonder who did that?). Kovac tramps into the woods and ingratiates himself with Ford, which is unlikely for a couple of reasons, not the least of which is Kovac identifying himself as being from where Ford was embedded, with NATO troops, when he suffered the lowest moment of his life eighteen years ago. Anyway, Kovac plays nice for a bit and invites Ford to hunt with him the next day. In an equally unlikely development, in spite of his determination never to kill, Ford joins Kovac on his hunt. But of course, the real prey is Ford, and the most dangerous game is—well, you know the rest. Barely stretching its way to eighty minutes (plus a padded ten-minute credit roll), Killing Season comes full up with heavy-handed signifiers, from Ben's choice of reading (Hemingway's For Whom the Bell Tolls) to a hammered motif of lapsed Christianity (the climax takes place in a rotting church) that underlines the theme of living with the sins of the past. Killing Season isn't completely inept, though it comes pretty close. Evan Daugherty's script does serve as an allegory for cycles of war versus something much harder—and far more rewarding—to achieve: reconciliation. But on the way there, Johnson fails to achieve anything like suspense: it's clear early on that the tables will keep turning like a lazy susan. The resolution of the conflict does come as something of a surprise, but it's too little too late after eighty minutes of wan engagement and wandering dialects from the stars, not to mention the "don't look directly into it" effect of Travolta's fake beard, the only virtue of which is that it makes Travolta's surprisingly subtle toupee look real by comparison. Millennium brings Killing Season to Blu-ray with little fanfare and hardly any extras. The A/V specs are strong enough. The disc presents the film in 1.78:1, which appears, technically, not to be the Original Aspect Ratio, if the trailer and featurette included on the disc are accurate indications (both show images from the film in 2.35:1). Killing Season had a very limited theatrical release, but purists may well take issue with that choice, which offers more vertical information but less horizontal information, presumably to be more HDTV friendly. That issue aside, the picture looks good, if perhaps scrubbed a bit too finely of grain. So-so black level and contrast aren't too much of a bother, as detail is excellent, given a completely clean and crisp source. Color is accurate for a generally muted feel occasionally goosed by some warmer interior lighting effects. Only two bonus features made it onto the disc: "Killing Season Featurette"—with clips and comments by Robert De Niro, John Travolta, and director Mark Steven Johnson—and, filed under Previews, the "Killing Season" trailer (1:40, HD). All site content © 2000-2019 Peter Canavese. Page generated at 04/25/2019 02:32:59PM.